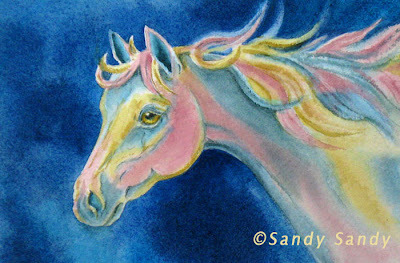 *SANDY SANDY ART*: Spring Has Sprung! Happy "official" FIRST DAY OF SPRING! I wanted to give this pony another workout using the glazing technique. Starting with an under-painting of spring colors, yellow, red and blue, I first wet the paper on both sides, like my usual wet-in-wet approach. The background wash was done at the same time as the first glaze of pastel colors on the horse, as illustrated in step one of my previous post. I let the paper dry and then followed the advise of my friend and accomplished watercolorist, Carmella Tuliszewski. You can read her very thoughtful and informative comment on my last post. I mixed my primary color's compliments into the base color, using only the original three colors, for the shadow areas and eliminated the neutral grey wash entirely. This was actually done in only two steps. It is much closer to my vision for the piece and I am considerably happier with today's results. Blessed Ostara/Happy Spring, Sandy to you and your hubby, and all the animal friends. Hurray for Spring. Your pastel pony is delightful!!! This is lovely, the colors appear clearer, bolder than the first version. Love the softness of the eye. Beautiful, Sandy, and using the three primaries together without going to "mud" is not so easy to do! Love the brighter background. Lovely, Sandy, and most Spring-like!!! Happy Spring! Love the beautiful, colorful mare. Muchos Gracious Senoritas! Thanks for the Spring/Ostara blessings, Robin! Yes Maria, this one is not overworked, like my first attempt was. I used to do a lot of animal portraits in watercolor and would always do the eye first. Because if it isn't right, nothing else matters. Thanks for your wonderful support and coaching Carmella! You are right about the mud. It took some experimenting. I took a photo of my palette with the primaries and the shadowed primaries, with the compliments mixed in, which I'm going to post here for reference. As always, thanks for your comments, Kathryn. And, guess what, I think I'm going to try this one AGAIN, only bigger, in the near future!! And Jen, Ditto to you, you beautiful colorful mare! Wow, I found five comments this morning on this post !! I am psyched!!! Thank you all VERY much! !